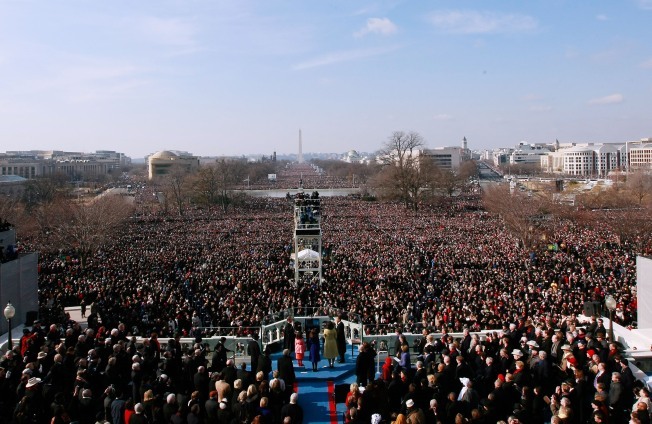 A view of the crowd on the National Mall during Barack Obama's inauguration in 2009, when the grass got trampled. President Barack Obama's second inauguration takes place Monday, and there's a lot going on. In an effort to keep you abreast of the action, we'll be bringing you a daily round-up of the coverage. Obviously an undertaking the size of an inauguration requires practice, but President Obama has other things to do this week. Meet U.S. Air Force Staff Sgt. Serpico D. Elliott, the man who's been serving as his stand-in. This year's inauguration will have a New York flavor, thanks to master of ceremonies Sen. Chuck Schumer, who has seen to it that everything from the water to the wine to the desserts and honey to be served all hail from the Empire State. If you think you're not being properly represented in Washington, you should try actually living in the District of Columbia, which has literally no representation in the halls of federal government, despite having to pay taxes. Close observers may notice that the president's limo on Monday will bear license plates that say "Taxation Without Representation," a nod to efforts to right that wrong. Never heard of the Black McDonald's Operators Association? Then you clearly haven't been keeping abreast of the people throwing parties this long weekend. If you're worried about the grass on the National Mall, which got trashed in 2009, fret not — new measures are being taken to keep it safe. There's been a lot of talk about how fewer people will be heading to DC for this year's festivities. Among those who can't be bothered? Oprah!